In some ways, words can hardly capture the essence of No. 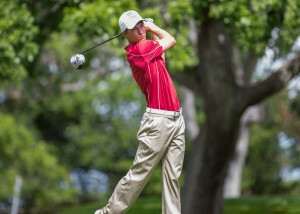 13 Stanford men’s golf’s final day of play at the Pac-12 Championships. In other senses, a single term seems almost sufficient: extraordinary. The conditions faced by Stanford’s lineup were extraordinary, with 20 mph wind gusts at the Pullman, Washington course threatening to carry any imperfect drive straight off the fairway. The implications of Stanford’s eventual victory were well outside the realm of normal as well, as the win gave a team which has counted legends like Tiger Woods and Tom Watson amongst its ranks its first back-to-back conference titles in its 54-year history. Above all, however, the play of the Cardinal’s squad, the manner in which each member’s titanium club-faces came into contact with his respective 1.62-ounce ball, was simply extraordinary. Sophomore Maverick McNealy headlined an effort on Wednesday that took a team placed firmly in second before today and made it look a league above its competition. Stanford had been just the third-highest rated team at the event, but it looked like it could have been the best team in the country through its consistent and dominating play that seemed to continually improve as the stakes got higher. McNealy captured the conference’s individual title with a performance that is better compared to the greats of Pac-12 history than to the mere mortals he teed off with in Pullman this year. The sophomore completed the 72-hole course a full 18 strokes under par and an astounding 10 strokes ahead of his closest competitor, Oregon’s Aaron Wise. His final score of 262 was the lowest total ever posted in a Pac-12 Championship. Even though he had virtually locked up the title by going 9-under through his first three rounds, McNealy’s most dominating performance was on day four. His nine birdies without a single bogey on the final round beat his own record for lowest score posted in any round of the tournament by four strokes and set a course record. “I was just staying aggressive, trying to make birdies for the team,” McNealy said of the effort. “At that point I wasn’t too worried about the individual [standings], and I just wanted…to [help] give my team a chance to win. “It was the best round of my life,” he added. McNealy’s record-setting performance overshadowed what proved to be a spectacular day for the entire lineup. Sophomore Viraat Badhwar posted his lowest score on the event’s final day, birdying three holes on the back nine to go 2-under on the day. Junior David Boote and freshman Franklin Huang managed to get to the clubhouse at even par and 1-over respectively, and senior Patrick Grimes posted a 2-over to give Stanford a 7-under overall, the best round posted by any team in the tournament. Combined with an inexplicably poor performance from day three leader Arizona State, Stanford’s final round helped the school come in first overall by 16 strokes, an almost unheard of margin. Huang came in second overall for the Cardinal, with his 1-over landing him in a tie for 11th overall finish. Boote was just a couple strokes behind Huang at 3-over. Stanford’s greatest test of the season is still to come, however, and it will hope to earn a chance at the national title after a strong performance at NCAA Regionals on May 14. The Pac-12 Championships will count little toward this effort, but the Cardinal’s spectacular performance should give them plenty of confidence going into these critical tests.